The interpretation of a Sleeping Giant can be in many ways; one can refer to a well known rock that’s named as a Sleeping Giant, or perhaps come out with your own definition after you watch Andrew Cividino’s film. But one thing is certain, you won’t be left indifferent once you get deep into the story being told in this film. 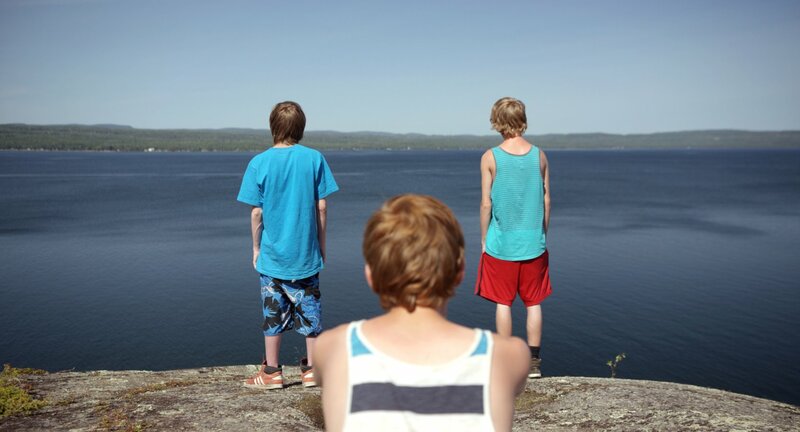 Three teenagers spend their summer in a cottage on the shores of Lake Superior. As they find their freedom in the countryside, they intend to test their limit which takes them way too far to come to a stop. Adam is a very shy boy who is not like his new friends, Riley and Nate, who is a huge fan of ugly truths. At one local celebration, Adam finds out from his friend about his father’s adultery that changes him significantly, transforming him from a quiet lamb into a lion, of course, not physically, but rather mentally. While Adam has to deal with his inner problems, he finds himself at the center of massive changes occurring around him, but mainly due to his friendship with Nate, who is willing to break anyone’s life without thinking of the consequences of his actions. When the film begins, you find a breathtaking scenery of rocks, cliffs that slowly takes you into a suburb area where it no longer looks as magnificent as the rocks. After sometime you will be taken back to the same rocks, which, I must say is the leading part of the film. It has the power to inspire people into many unimaginable beautiful things, but meantime, can take everything you loved and cared so much within a second. While our heroes have to face the challenge brought by the rock, a huge hit awaits them in their personal life, where they must find themselves before it’s too late. Here is when the importance of Adam is so obvious, as he is the only one who is capable of stopping the incoming storm, before it takes his mind completely away. Cividino’s film studies well the lifestyle of teenage boys, whose fearless actions or the adrenaline that rages in their blood makes them take unthinkable and risky steps. It makes its heroes analyze their own lives and future, that may not be as promising for some of them. But the important lesson that this film delivers is, of course, knowing when to stop before it’s too late. Because whatever is done, can’t never be undone. That is certainly something Adam will learn about.